BELI® also have another roll forming mills, Duplex Mill. which is widely used in Steel Profile Roll Forming Machine. Steel Door Panel Roll Forming Machine, Panel Roll Forming Machine, Sandwich Panel production Line. Cable Tray Roll Forming Machine, C Purlin Roll Forming Machine, U Purlin Roll Forming Machine, C and Z Purlin Roll Forming Machine, etc. a duplex mill. Duplex mills have one common base and drive . They can form both edges of narrow or wide products leaving the center flat. The minimum strip widths depend on how close the opposing rolls can be pushed together. And the maximum widths usually depend on how far the two mills can be moved from each other. The width of the formed products can be changed quickly by adjusting one or both sides of the duplex mill in or out. BELI® Steel Door Panel Roll Forming Machine is able to form 300-1200 mm width door. Duplex mills have the same advantages and disadvantages as the cantilevered mills, except that the shaft end connecting pieces cannot be used. Some duplex mills have shafts extended at the other side of the mill, which can be used to form narrow sections. Duplex mills either have one side fixed and the other one adjustable, or both sides adjustable. Adjustment of a side is usually accomplished by placing all stands on one plate, which, with proper guides, can be moved in and out, thus changing the gap between the two cantilevered mills. And for duplex mills with one adjustable row of stands, the centerline of the product changes with width change. In the case of duplex mills with two adjustable rows of stands, the centerline of the products remains in the same position. This arrangement is used when holes are pre-punched at or around the centerline, either when the cutoff die has to be kept symmetrical or for other reasons when it is advantageous to keep the centerline in the same position. width, only input the required width on the touch screen, then the machine will be adjusted automatically . 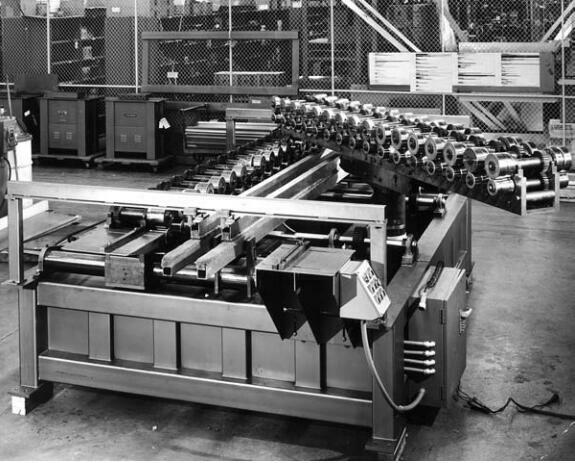 Forming rolls installed in a cantilevered or duplex mill are exchangeable to produce different profiles. BELI® offer 2 methods to change the produced profile, one is change the rolls step by step, another one is replace all the mill. ( See the right photo) BELI® Steel Door Panel Roll Forming Machine can easy change the profile design, and all are customized. the exchange time will be only 1 hour. the forces is large and the support prevents the sheet to buckle downwards, then it can buckle upwards. should not scratch or mark the product. Embossing, lancing, louvering, or other similar operations, As usual, the door panel width is up to 1200mm or more, so our Steel Door Panel Roll Forming Machine adopt Center Support ” Fluent strip” , easy to adjust.